Air and sundried white or red grapes with seeds. Raisins can be eaten alone or mixed with other fruits or cheese for a healthy snack. They are often used in baking and making fresh salads. Substitutes: Other fruits that are itted, Chopped dates, Prunes, Or dried cranberries. Choosing: Most raisins are sold in boxes or packages you cannot see through so it is difficult to judge freshness by the eye. However, most boxes can be squeezed so you can get some idea of how fresh the product is. Choose the product that submits to pressure. Shake the box or container and avoid any that rattle loudly, an indication the raisins have dried out too much. Procuring: Most raisins are dried naturally by the sun right in the vineyards, although some are mechanically dehydrated. Once sun-dried, a process taking two to four weeks, they are then graded, cleaned, and packed. 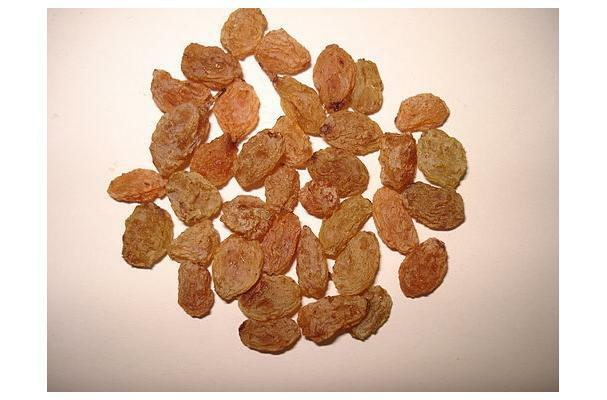 Some raisins are kept golden in color by the use of sulfur dioxide (sulfites). Raisins may be eaten raw or used in cooking and baking. Cleaning: As they age, be sure to examine them carefully for insect infestation before using. Seal raisins in an airtight container or bag and store in a cool, dark place. Most kitchen cabinets are too warm. A month on the shelf is maximum, after which they begin to dry out, darken, and lose vitamins. Refrigeration is recommended for storage longer than a month. Under refrigeration in a properly sealed container, raisins can last 6 months to 1 year. History: Until medieval times, raisins were the second in choice as a sweetener, honey being the top choice. At one time in ancient Rome, raisins were considered so valuable that two jars could buy a slave. In the 13th century, Damascus had quite a reputation for their sweet raisins.